Are you looking to replace lost or missing teeth? Dr. Keith Brewster dedicates only high quality implant dentistry to the Dallas, TX community. He has been providing implants to patients for over 20 years. Dr. Brewster strives to provide the best experience for those seeking dental implants in Dallas, TX. Our Dallas implant dentist offers a wide range of dental restorations including single-tooth replacement, dental crowns, bridges, as well as utilizing modern technology such as Cerec CAD- CAM and Galileos cone beams scan. Dallas Implant Dentist, Dr. Brewster begins with a consultation with the patient, offering 3D Imaging which helps plan the course of action as well as seeing how much room and space there is to work with. For more complex cases, our Dallas dentist uses a computer guided implant. Dr. Brewster also believes in educating each and every patient, giving them both options and providing full knowledge of dental implants. If you are still unsure of your decision at some point, Dr. Brewster also provides patients with before and after photos of implant procedures. When it comes to the actual treatment, Dr. Brewster places the implant, making sure to not destroy the tooth and salvaging your tooth structure while perfectly preserving your bone structure. Dental Implants are artificial roots that are surgically placed into the upper or lower jaw bone by our Dallas implant dentist. The teeth attached to implants are very natural looking and often enhance or restore a patient's smile. These implants are a great way to replace missing teeth and also provide a fixed solution to having removable partial or complete dentures. They provide excellent support and stablility for these dental appliances. We look forward to your next visit with Dr. Brewster, your Dallas implant dentist. Modern Technology allows the CONE BEAM 3D technology and CEREC crown software to be used together and do a more complete visualiizing and planning for nerve trunks and sinus cavity shape and size for the most ideal placement that was not available before. This type of technology allows Dr. Brewster to place the implant in the most ideal site to allow for the crown, bridge or fixed retention denture to be placed with variables that were not able to be visualized in the 3D planning before. 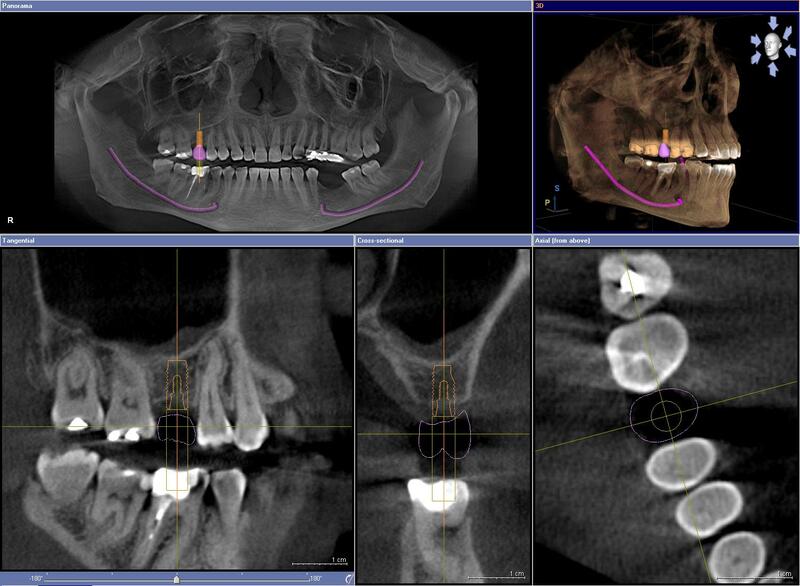 The CEREC CAD-CAM plans for the most ideal crown to be planned and then the implant to be placed with GALILEOS CONE BEAM SCAN computer guidance.